My friend Robyn does such a great job of teaching her kids the true meaning of the holidays we celebrate. 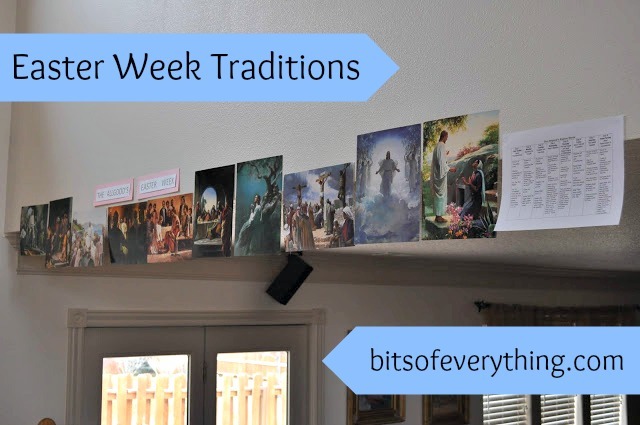 I love all the traditions that they do, and I’m hoping to implement some of them with our family. I asked Robyn to post her Easter week traditions here, in case you need some last minute ideas! I love Easter. I have posted in the past about some of our activities. I thought I would share our Easter Week schedule. Yes, I know I’m doing this a bit late but for those who might join in or want to give it a go next year I thought I would share. Display picture of the Triumphal Entry from the gospel art kit. Make palm leaves with brown or green paper. Act out Triumphal Entry using the palms. Display picture of Christ cleansing the temple. Discuss why Jesus did this. Clean the house or help with a household chore. After the house is clean we hide 12 plastic eggs with the Easter symbols in them. The kids take turn opening them and reading the accompanying scripture that tells the Easter story and the meaning of the symbol inside. Display a picture of Christ teaching. Discuss what parables are (Bible Dictionary “parables”). Discuss what anoint means (Bible Dictionary “anoint”). Color or make 30 silver coins while discussing Judas’s betrayal. Explain that 30 pieces of silver was the price commonly paid for a male slave in Jesus’s day. Ask the children if they feel Jesus was worth this price, any price. Testify of his infinite worth. Display the picture the Last Supper and of Christ washing the apostles feet. Prepare a simple Passover meal discussing the symbolism of the food. End by singing a hymn. Display picture of Christ in Gethsemane. Display pictures of Jesus’s trial and Crucifixion. Make a crown of thorns. Taste the difference between vinegar and water. Listen to Handel’s Messiah or Conference Talks about Christ while getting ready for Church. Discuss how Mary and the Apostles felt. Easter Dinner – fish and other foods contemporary to Christ’s day. Watch Easter Video (either Lamb of God or Easter Dream). I know this can seem overwhelming at first. You can just add in a few of the traditions each year. I’ll admit that the first year we did it, it seemed like a lot but then most of the work of preparing for it was done and subsequent years have been less prep work. You can always just show the picture for the day and read the scriptures to get started. Wishing you a glorious Easter!